We know that we’re a bit early, but Veteran’s Day is right around the corner. In only one short week, we will be celebrating our veterans on the 11th hour on the 11th day of the 11th month of the year. According to the US Census Bureau, there are over 21 million living veterans in the United States. On Veteran’s Day, we all get a chance to thank these heroes for their service, but as Lions, we have an opportunity to go one step further. We can show our appreciation by inviting them to serve with our clubs and reconnect with their communities. In July 2013, Lions Club International introduced the Involve a Veteran Program. From now until June 30, 2017, qualifying veterans will receive waived entrance and chartered fees when they join a Lions Club. Eligible veterans include all branches of the US military – Army, Navy, Air Force and Coast Guard personnel who are retired or honorably discharged. The National Guard and Reserve personnel who were called to active duty for other training are also eligible. Learn more about the program. Invite veterans to help serve at one of your club’s community projects. Leave club brochures at your local VFW. There are over 30 locations in Wisconsin alone; find a location near you. Honor veterans on your club’s social media accounts. Start a new club branch with Veteran members. This Veteran’s Day, join the 700 clubs that have taken advantage of this program and given veterans the chance to continue serving as a Lion. Happy Veteran’s Day from all of us at Lions Pride! By now, you have likely heard that we are anxiously awaiting the arrival of our largest annual event, the 8th Annual Lions Pride Shoot Sporting Clays Fundraiser; however, you may be new to the idea. Although the hobby is quickly becoming one of the fastest growing sports in the America, the term, ‘sporting clays’ is still relatively unfamiliar to many. Sporting Clays, also referred to as “golf with a shotgun”, is a sport that simulates actual hunting. Courses reproduce the hunting of ducks, pheasants, upland birds such as grouse and quail, and even rabbits. There is no set season so sporting clays can be shot at any time. The sport may be new to you, but it actually has an extensive history. Sporting clays go back to England in the mid-1800s. In those days, gentlemen owned all large estates. Their land consisted of countless numbers of acreage where nearly unlimited game could be bred and reared. To hunt on this land, you need to be invited by the owner. The chance of an invitation depended greatly on your social status, but you also needed to be a reasonable shot. Landowners wanted clean shots, not just injured game. Since land was limited to the upper class, there weren’t many places available to practice; many shooters attempted to create game-like targets. 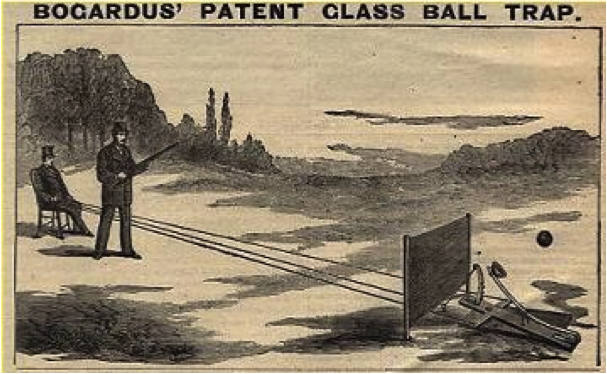 The first targets were glass balls, but they were not ideal for practice. They were very expensive and hunters found that they were injuring their cattle with broken fragments. In the 1880s, George Ligowsky invented the first clay target after seeing children skimming clamshells on a pond. He also designed launcher to replace the children’s throwing arm by “flicking” the wrist. As new targets and launchers were developed, more shooters started training to prepare for a hunting invitation, but the practice soon became a sport all of its own. Today, people of all ages enjoy the sport. 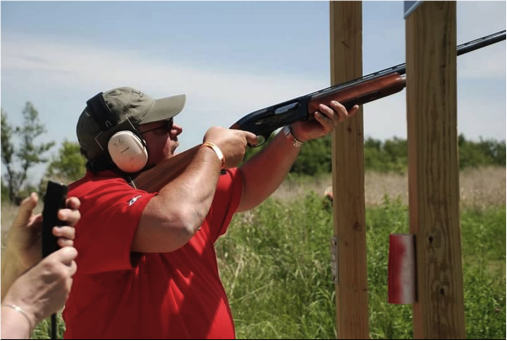 More than 3 million shoot sporting clays competitively or recreationally each year. We hope you’ll join us on June 13 at Milford Hills in Johnson Creek. Last year, we had both Lions and non-Lions of all skills levels compete. If you don’t shoot, you don’t have to miss the fun. We always have participants who choose to walk the course to watch the activities and take in the beautiful scenery of Southeastern Wisconsin. To sign up or for more information email us or call the Lions Pride Office at 715-677-7000, or visit us on-line at www.lionspride.org/events. Hurry, the registration deadline has been extended to Monday, June 8! We look forward to seeing you there.